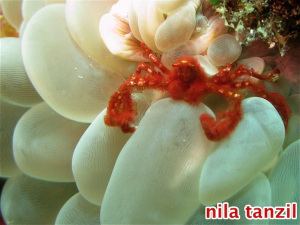 Nha Trang is one of the most desired tourist destinations in Vietnam. One can go there by bus from HCMC or take a local plane, which costs around 1,500,000 VND for return tickets. I chose to fly, of course. At the airport, I was a bit lost coz I couldn’t see “Nha Trang” as the destination. 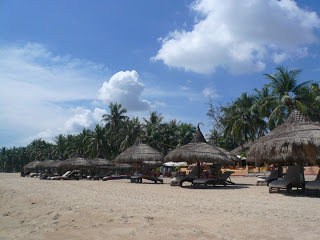 Apparently, we have to go to Cam Ranh first, because there’s no direct flight to Nha Trang (read: no airport there too). Aha.. of course! The flight took about 50 mins from HCMC to Cam Ranh. 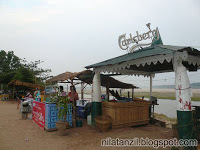 The crew didn’t give us any food, only softdrink, most probably because it was only a short trip. 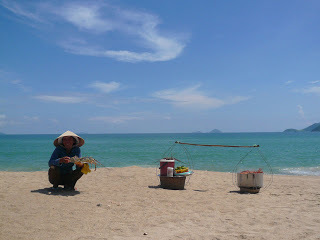 Arriving in Cam Ranh, we took a cab to Nha Trang. One thing I learned from my experience in HCMC: always ask the taxi driver to use meter! So, I told that to the cab driver and, of course, he said yes. Enjoying the scenery from the back seat, Danny started to notice that something was wrong with the meter. It went so fast. We only drove for 10 mins away from the airport, but the meter showed 100,000 VND! It couldn’t be!! So bloody expensive! We’ve been told by Ruud that it takes 40 mins by cab to the heart of the city and costs around 150,000 VND. So, with the meter runs this fast, it means that for 40 mins drive, we have to pay 400,000 VND! Wow! The driver must have done something with his meter machine!! *(*&^%$#!#?! I told the driver to stop the car and told him that the meter went too fast. He didn’t speak English. And I didn’t speak Vietnamese. Great! What shall we do now? I tried to bargain the price to 150,000 for the whole trip. He disagreed and asked for 350,000 VND instead. “This is such a rip-off!”, I said to Danny. I was looking around and there was no car on the street. It was empty and in the middle of nowhere. Great. We couldn’t just got out of the car and hitchhike to the city, I thought. Nobody would pick us. Even if they would, it might take a few hours until we found cars passing the street. Gosh. The cab driver was happy coz he’s in the good position to bargain. Damn. I hate it! 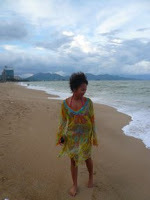 At the end, after a tough bargain, we managed to get the price down to 200,000 VND. He was acting as if the price was too low, but we knew that he was happy for his success to fool two mixed-blood tourists! 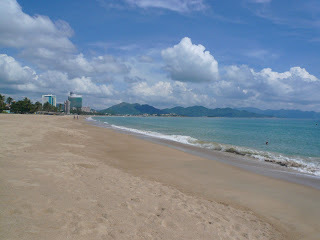 Nha Trang beach looked so beautiful in the morning. 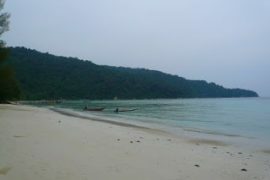 The clear turquoise waters with white sands beach laid before me, bordered with mountains. Indisputably beautiful. One could also enjoy walking down the 6km beach or just lay back and lounging around on deck chairs at a beachfront bar drinking cold beer served in frozen glass or cocktail with the sun smiling from above. Nice. I spent almost a whole day sunbathing on the beach. The sun shines strongly, perfect to get some tanned! Even so, the weather wasn’t too hot because of the wind breeze softly. I, then, put on my tanning oil and laid on the chair, reading a book with a bottle of cold beer next to me. Sometimes people came over offering postcards, snacks, printed-watercolor paintings, Vietnamese’s style of seafood dishes or books! The latter was amazing. 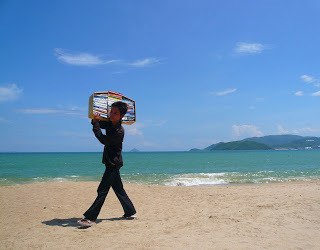 The seller brought a pile of books on his shoulder and carrying it around everywhere! He was definitely a mobile bookshelf! hahaha.. The books were all copied-books. No wonder they’re cheap. Every time he passed by, I felt so sorry for… his shoulder! He might need to be treated by a chiropractor in no time!! Those books are heavy!! Can you imagine that??! After 1pm, the wind got stronger. I even felt a bit of chill. And there were more tourists, too. Mostly Westerners, but still not that many. Some of them swam on the beach, while a lot of them just sat and laid on the deck chairs. Trying hard to get tanned, some of them ended up turning red and got sunburned instead. Ouch! Relaxing on a nice beach is one of my favorite activities on holidays. However, I love visiting temples and other cultural/historical places, too. There is one striking temple in Nha Trang, called Long Son Pagoda. The temple was founded in the late 19th century and the architecture is just beautiful. The main entrance is decorated with mosaic dragons — my favorite “animal legend”, which happens to be my Chinese zodiac too (or we call it “Shio”). It was already dark when I got there. So, I couldn’t get nice picture of the temple. Too bad ☹. Fortunately, the temple was open, still. Three Vietnamese girls accompanied me and explained a little bit about the temple. They live and study there. During the day, they work in the temple’s shop, selling postcards for tourists. The money goes to the temple. The girls took me around the temple. In the main hall, there’s a Buddha statue in the center, while in the main entrance to the main hall, there’s a Shiva statue, one of Hindu’s gods. Weird, eh? A combination between Buddhism and Hinduism temple, that is. There are a number of monks also live in this temple. When I was walking around, I was touched to see an old Buddhist monk sitting on an old wooden chair listening to his younger folk reading a book. He looked really old and couldn’t even sit straight. The younger monk patiently reading Buddhist teachings from a thick book on his hands, flipping through page by page. Such a touchy scene for me. If you go at the back of the pagoda and go up to the top of the hill, you’ll see a huge white Buddha statue. Don’t forget to wear a pair of comfortable shoes/sandals though, as there are 152 stone steps up to get to the white Buddha. 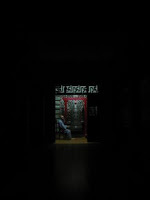 At the other side of the pagoda, there’s another hall where you can see the “Sleeping Buddha”. 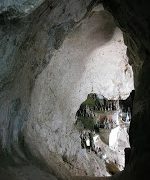 A huge white reclining Buddha statue is sleeping peacefully there with a smile on his face. Some Buddhist monks chatting on the terrace and smiled at me when I passed them. I loved this scene. Looking at them chatting with their peers, reminded me of Shaolin kungfu movies, my fave kind of movies when I was a child. Hehehe… I wonder if these monks are good with kungfu, too ☺. It must be cool! 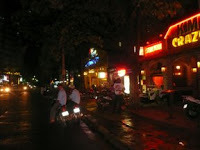 The best way to wonder around Nha Trang is by motorbike. One can rent a motorbike for 25,000 VND/hour or 70,000/half-day. Most locals don’t wear helmets (not in Nha Trang, nor in HCMC), in which I think is pretty dangerous, considering the way they drive their bikes here! But if you’re not sure of your driving skills, better take a cab or xe om (motorbike taxi) or… cyclo – Vietnamese bicycle rickshaw! 😉 It’s nice and relaxing, too. Don’t forget to bargain ya.. 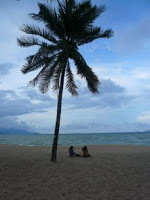 I saw the pictures in Nha Trang that you added in the facebook. I could say, It’s awesome. Make me want to take my backpack and fly there. I envy you !! been dreaming to viet.. Wonderful review of your trip. Do we need an international driving licence to rent their motorbike?! I guess it’s better to stick with their cab, huh?! @Lita: thanks, dear! yeah, take your backpack and fly there! u’ll gonna love it. everything is cheaper there, too! and the food.. oh.. so yummy! @the razzler: they didn’t ask for the int’l driving license when we rent the motorbikes. And, i rarely see policemen on the street, too! 😀 so, I guess, you can try your luck! I love your travel blogs. makes me feel like i have been there.